Two Bros' P1X PowerTip sound suppressor is a recommended accessory for our exhaust systems with M or S1R series endcaps. A straight-through sound diffuser, the TBR PowerTip quiets the pipe about 7-8 dB with no significant reduction in horsepower. May be used with a spark arrester screen. 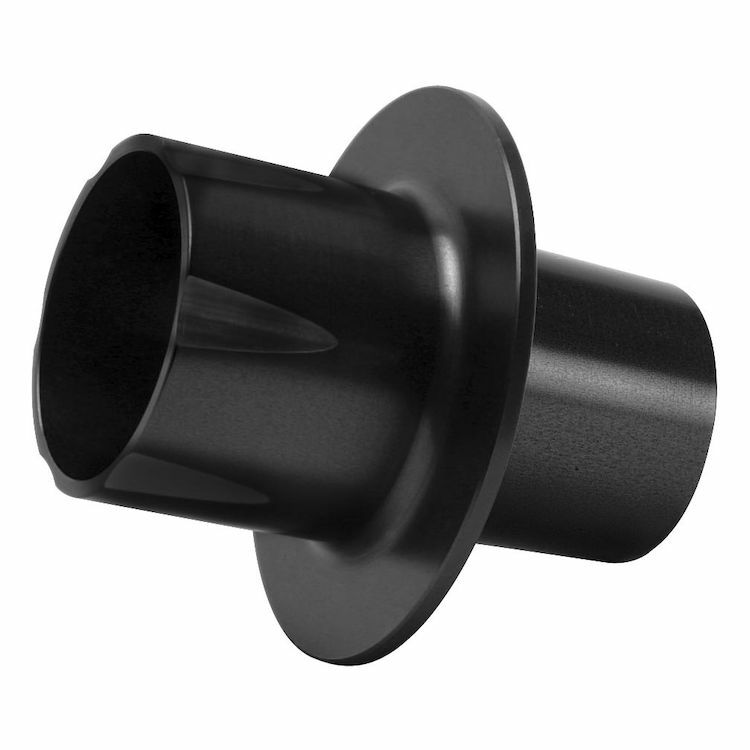 Easy to install - simply unbolt your existing M or S1R series endcap, drop in the P1X and reassemble. Note: Gold finish may not have the silver highlight cuts as pictured. The M2 series exhaust is too loud for the track if they enforce sound limits at 104dB or lower. If it performs as advertised this should bring the sound level down within required limits. Helped the loudness greatly while retaining the incredible sound of the two brothers exhaust on my 2015 Vulcan S. I had to do a little modifying for the tip to fit. Works great, I love this product. Slightly quieted down my Two Bros M2 exhaust. Eliminates most decel popping. Based on the reviews, I figured it will make my ZX-14 a bit quieter. I will soon find out if it was worth the purchase. Now, the TBR mufflers have the right volume. work very well and it make a big difference. its good for a normal riding and if you want to punch it the sound is still there. great product and i yes would recommend this product. Bought this to go with my M2 slip-on. Works amazing and reduces the noise of my bike. A friend told me he could hear me coming without it from a couple miles down the road on the only road to my village in Germany. Helps reduce the need for ear plugs but still recommended to wear them even with this tip. So my ears stopped bleedingð??? Could tell the difference in noise on the revzilla video, I leave for work at all hours so I don't want to make my neighbors mad with my new exhaust. A friend of mine that rides wanted me to get this for him. Softens the tone of my titanium Black Series M5. It was too loud out of the box, but this P1X makes it perfect. The exhaust is now muted on the long highway rides and in the neighborhood, but deep and throaty when you want it. Great add on for those who want their M5 pipe a bit quieter than normal, perfect for my Concourse 14.
the silencer it self is working good and removing all the loud sound, its wonderful. but after using it for two hours, the silencer complete melt from the over heat!!! Great addition to my 2 Bros. pipe. The pipe still sounds great but not overly loud. Too reduce noise and maintain power. Want to reduce the volume on my Two Brothers Black M2 mufflers. 2017 FZ-10 Two brothers 3/4 setup is really loud, trying to cut down noise. Bike came with excessively loud exhaust already installed, and I am not ready to replace the complete exhaust just yet. Two Brothers exhaust on my 600rr was too loud this power tip make it ridable again. The two brothers exhaust are just a little too loud for long rides. Hope these tips will quiet them to a tolerable level. needed less DB's from two brothers exhaust. Made the Two Brother's S1R Slip-On sound at a more comfortable level. The S1R looks great and sounds mean... Too mean.... like call the cops mean.... so this will help tone it down a touch. After buying the 2 Brothers Silver Series for my ZX6R , I found the pipe to be too loud. Even with earplugs, I found the slip-on to be obnoxious and it would cause rider fatigue. With the Power Tip, it tones it down the volume considerably and IMHO gives the slip on a better tone at highway speeds. You lose the idle rumble a bit but overall your ears will thank you for it. To quiet my bike a bit. Made a difference but still too loud plus i had to make my own spark arrestir. I needed to quiet my two brothers black exhaust. I live in a residential neighborhood and I don't want to been seen as an prick to my neighbors. Just added the Two Brothers M2 exhaust. It sounds great but is loud. I ordered these to quiet the sound but retain the power increase. advertised to fit without any adjustments ,time will tell once i get it. See if I can make the M2's a little quieter for the neighbors. I purchased this because I wanted the option of riding around with my bike a bit more quiet as the Two Brothers tend to be a bit loud...AND IT WORKS WONDERS. My M-2 Vale slip on was just a little too loud, this should make it slightly more tolerable. I get too many complaints about how noisy my TBR exhaust is! Will this product (P1X Power Tip) work with the Two Brothers M-2 VALE Slip-On Exhaust? BEST ANSWER: Yes I purchased the P1X with the M-2 VALE and it worked great! I have a set of these in these pipes on a DL1000. Takes a little of the noise down and gets me legal in MN. Easy to take out if you want to. does it fit on the M-7?? Does it fit the 2in1 Comp-S Exhaust for Dynas? BEST ANSWER: These are listed as only being intended for use on the M-Series exhausts. They may fit, but I don't think they should be used, or will give you the expected results. I would contact 2-Bro's support to be certain, but I am going to answer no, they are not to be used/intended to fit. (from personal experience/use on a 2013 Zx6R). No, I don't believe they will, these only work with M series or s1r series exhaust as far as I know. I bought a motorcycle with a two brothers black series exhaust, how do I know if it has an M or S1R end cap? BEST ANSWER: Go to TB website and look at what they offer. Compare to what you have.... easy. hello, will these work on a 2002 kawasaki ninja 250r with the two brothers m6 exhaust?